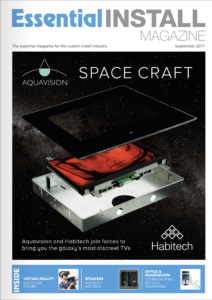 Aquavision, the inventor & premier manufacturer of quality in-wall and waterproof televisions has added a new distributor, Habitech, to its line up. 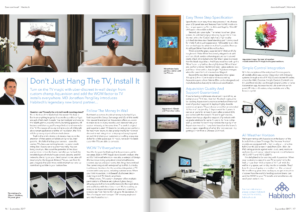 Established in 1997 with the world’s first in-wall television, Aquavision’s product range has evolved beyond its original wet area designs to address the desire for the seamless integration of TV screens with every space, including outdoor areas. The agreement, places Habitech’s proven sales and support expertise behind as many as six highly specialised Aquavision ranges, all meeting IP66 ratings, spanning screen sizes from 16” to 85” at up to 4K resolution, and available in multiple permutations of feature set, style and glass design for the finest installed performance quality. Above the standard options, the most demanding requirements can be satisfied by completely bespoke design combinations manufactured exclusively to individual specifications. Recognising Aquavision’s exclusive appeal to designers of both residential and commercial spaces, the brand deploys highly durable commercial-grade TV panels, which are engineered and warranted for an extended 16 hours of use per day, 7 days a week for 2 years (typically consumer brands are designed and warranted for just 7 hours per day).Custom installers will also welcome Aquavision’s easy control integration with 3rd party systems through IP, RS-232 and discreet IR codes; drivers for AMX, Crestron, Simple Control, Control 4 and RTI, and from IoS devices through Simple Control’s Home Automation App. On the planning side, back-boxes complete with PSU can be purchased separately for first fix, and for final fix, Aquavision’s ‘hole-in-the-wall’ guarantee promises the supply of an Aquavision model to fit any hole based the brand’s cut-out spec, regardless of when the hole was cut. 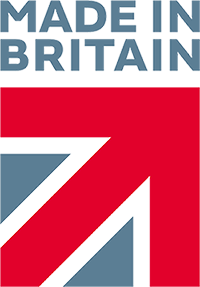 Habitech’s partnership with Aquavision coincides with the launch of the brand’s first outdoor TV range. The five new ‘Horizon’ models in 32″, 43″, 55″, 65″ and 85″ screen sizes and six brightness levels are supplied in an elegant white satin frame and include a high quality anti-reflective Full HD or 4K LED screen. An IP65 rating means that they’re protected against water, dust, sand, moisture and insects, and can withstand temperatures of between -40°C (-40°F) and 110°C (230°F).